Updates to the 2013 California Building Energy Efficiency Standards, known as Title 24, went into effect July 1, 2014. These changes immediately impact the state’s building industry, but over time could have a nationwide impact since many states use California’s building standards as models for their own. In order to comply many new homes will be built with continuous insulation, which uses foam board sheets on the outside of the framing covered with a plaster system specifically designed for the application. Fibrewall, fiber reinforced stucco system, can be used in insulated stucco assemblies to provide continuous insulation and help builders meet the stringent Title 24 requirements. 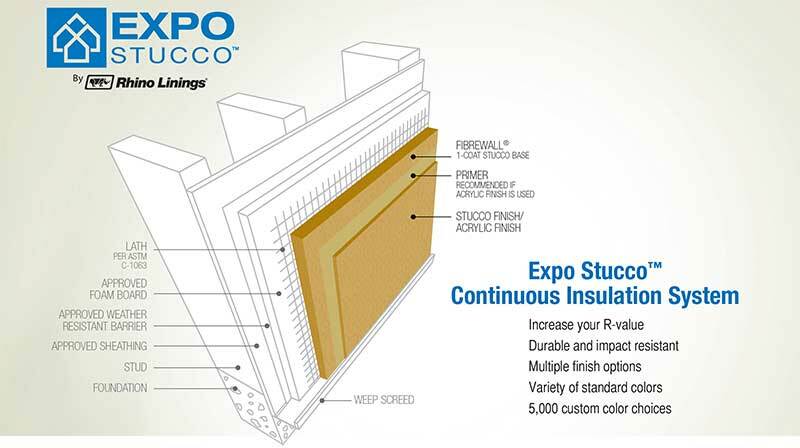 For detailed technical data and CADDs, visit www.expostucco.com or download the sales flier now.